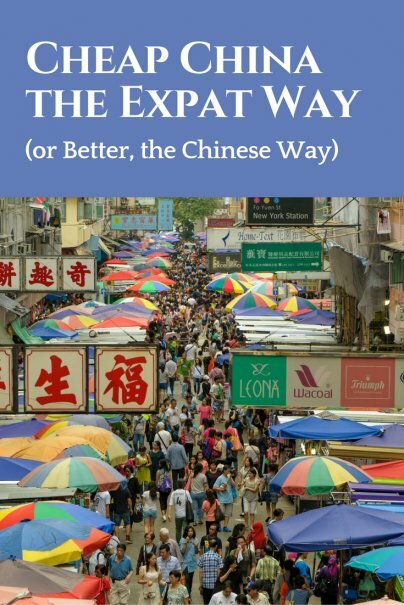 When I returned to China with my husband and friends in 2001 (after living there for a couple years in the 90s), I almost forgot the lessons I had learned about travel on the cheap in China. I picked up the phone and called a state-run tourism company, looking to rent a minibus to take a group of us to the Great Wall for an overnight campout. When given the price, I translated it into dollars and split it among my friends. I think it came to about $50-$100 a person, and at first we thought it would be worthwhile for a once-in-a-lifetime experience. Fortunately, before we booked it we chatted with a friend who was living there, who set us up with an independent driver with a van. We ended up paying the guy the same amount total as we were going to pay the travel company per person. And the driver was happy to get the job. When we were living in China, nothing made us laugh harder than hearing what American tourists paid for guided trips and Western hotels. OK, not everyone is ready to live the way even middle class Chinese do, which is far below the standard of living we are accustomed to. And it can be scary to venture alone into a country where a very small percentage of the population can understand English. But if you are adventurous enough to travel indepently and live just a little like the locals do, you can have a lot of fun in China for very few renminbi (Chinese bucks). 1) Avoid Western restaurants. Since eating foreign food in China can be a status symbol akin to eating French cuisine in the US, it's pricey. And often not very good. You'll pay less in many excellent Chinese restaurants than you will in below average Western ones. 2) Forgo a guide in major cities. Even if you speak no Chinese, you should have no trouble getting to and enjoying the Forbidden City and Great Wall in Beijing, the Shanghai Museum, and other major sites. They have English language audio tours, and you can get there by taxi. Hotel concierges can write out the Chinese characters for where you're going so the drivers will know where to go. 3) Start thinking in local currency as soon as possible. The sooner you realize that 50 renminbi is a lot more money than the $6 it exchanges for, the better. Six bucks is nothing, but 50RMB can be many things -- a pretty nice restaurant meal, a night in a hotel, a medium-to-long taxi ride. OK, my prices are a few years out of date but you get the idea. 4) Try to avoid being charged extra for being foreign, but understand that sometimes it's unavoidable. The average urban Chinese worker earns a few thousand dollars a year; migrant workers selling food in big cities make a fraction of that. So it's understandable that many people there see Americans as walking ATM machines. Also, at official sites such as the Forbidden City, paying the foreigner price is non-negotiable. But in other situations, you can bargain or just say no if someone tries to charge you more than the local rate. Dressing low-key without a lot of labels helps; if you feel comfortable claiming to be a student or a teacher it definitely helps, but that schtick isn't very believable if you don't speak any Chinese. 5) Take the train. China has an impressive rail network, especially compared to its highway network. As long as you avoid getting on an overcrowded train (no national holidays! ), it's not a terribly uncomfortable way to travel, and it's ultra-affordable. Personally I love watching the countryside roll by through an open train window -- I've seen water buffaloes in the rice paddies, stopped in small villages and seen the most breathtaking scenery of my life. Another nice thing about riding Chinese trains is that you have hours and hours to hang out with ordinary locals and for them to warm up to you. Once someone who speaks some English turns up, you're bound to have some very interesting Q&A sessions. 6) Use accommodations and services that are not specifically for foreigners. The train is one of them. Another money saver is taking a Yangtze River cruise on a "Chinese" boat. You won't get English-language commentary and the cabins won't be as nice (OK, ours had roaches), but the price difference will be huge. The cheapest hotels are often not open to foreigners, but plenty of midrange and pretty darn cheap ones are. 7) Eat street food. The longer time you have to spend in China, the better idea this is. If you only have a few days, you probably want to be pretty careful about what you eat to avoid spending the whole trip in the bathroom. I have a handy rule for staying safe eating food sold on the street: If it came right off an open flame or out of a bot of boiling water or a very hot cloud of steam, it's good. Barbecued lamb skewers, dumplings and bowls of noodles can be enjoyed at ad-hoc roadside restaurants for a few pennies -- and the experience is priceless. For more cheap and tasty, hit a night market. 8) Take the public bus or one of the private minibuses running the same lines. OK, you really need the help of someone local in this endeavor because last time I was in Beijing you were not going to find an English language bus schedule posted. Maybe no schedule whatsoever. And the crowds can be intense. Once I almost got punched when a couple of passengers engaged in a fist fight although they could barely lift their arms due to the crowd. 9) Join up with a guided Chinese tour. You can get a very cheap trip to some sights outside of Beijing by signing up for a Chinese bus tour. This can be good for laughs -- both on your part on on the part of the Chinese folks on the bus. But there is a downside besides not being able to understand the tour: A lot of these trips stop at "the jade jewelry factory" or "the perfume factory" for some sales pushy presentations. 10) Rent or buy a bike. Many foreigners living in Chinese cities get around on bicycles, thereby avoiding some of the traffic congestion and possibly saving money (the high bike theft rate in Beijing might negate any savings). Biking in Chinese cities is quite dangerous, and you're not likely to find helmets for sale. Still, you have more freedom this way -- you can explore without having to negotiate ticket buying or worry about being cheated by an unscrupulous cab driver. And you will be seeing the cities the way the residents do. Great tips Carrie, though 50 renmibi isn't quite $6 anymore. The exchange rate is now 6.86 RMB to a dollar, so it's a little more than $7. Also, inflation in China has been pretty rampant in the last few years so everything is more expensive. Also, they doubled the price for EVERY major attraction last year in preparation for the Olympics so it isn't as affordable as before. Well, thebaglady's comment about Beijing brings up yet another tip: If you are really on a shoestring, stay out of the capital. You can see some amazing places, like Xi'an, and have interesting cultural experiences in countless places where the cost of living is still dirt cheap. I currently live in China. I have been here long enough to see thousands of stupid laowai tourists get scammed every year. Forget about official exchange rates. Don't compare your country's currency to the Chinese Yuan when buying or paying for anything in China that is not imported or a genuine foreign Brand made overseas. The simple rule is that if something costs $1 US Dollar in Peoria, it will cost 1 RMB (Yuan or Kuai) in China. That can of Coca Cola is 2 RMB in China. In Peoria it's probably about $1.50 now (I've been here so long I am not sure of current prices in the states). A Disposable lighter in China is anywhere from free to 1 RMB. In the US, it's about 1 USD. A can of local beer is about 2 to 3 RMB at the local shop in China. In the US, probably just under 2 bucks. A quality shirt at a market stall sells for about 30 to 40 RMB. At Sears in the US the same shirt sells for about 30 to 40 USD. A pack of Cigarettes costs anywhere from 3 to 100 RMB depending on the brand. In the US, a pack of Marlboros probably costs about 3 bucks in most locations. Timberland shoes can be bargained for about 100 RNB (despite a sellers initial sales price of 800 RMB). In the US, Timberlands go for about 100 Bucks or more. Sure, in China they may be seconds or even counterfeit, but the quality is really comparable to those sold in the US. My 100 RMB Timberland walking shoes bought in Beijing three years ago lasted longer than the pair I bought in the US. This 1 to 1 currency conversion can work for the US dollar, British Pound, Canadian dollar, and Australian dollar. I appreciate this information - I am currently contemplating a move to Guilin, China - I am currently living in Mexico on my SS check and I find it inexpensive here, rather than fighting the rat race in Panama City, FL where I am from. I hope to be in China after the first of the year. What Peoria are coming from Illinois or Arizona ? I am going to study abroad in Shanghai for about 4 months. That's a good way to think of it, although I might say the 1:1 ratio works better if comparing to prices in another world capital than in Peoria. Ten years later, we still have some things we purchased at the Silk Market in Beijing: so-called North Face thermal sleeping bags and a knitted scarf with a misspelled "Calvin Klein" label are the things that spring to mind first. Of course, I also bought a ton of things that unraveled or fell apart within the first year, or proved too uncomfortable or sheer to wear. Even for people who are visiting countries other than China. I remember the first time my midwestern friends went with me to Mexico (I'm from so cal) and insisted we doe things the 'tourist' way. It was shocking how much it cost! I was used to doing Mexico the mexican (or so cal) way! that would be quite a bold move, Larry. I'm planning to move to China on October to work teaching English, Spanish and Portuguese for at least one year. My Mandarin is basic but understandable. I've heard horror stories about teachers not being paid by rogue schools over there. Does anybody have some wise hints about avoiding that? ... for so many valuable tips! depends on where you live in China, I live in Beihai during the summers and have bought a new apartment there with my Chinese wife. Life there is great to me, all the people there are nice and i have learned, let the wife go shopping and I go wait drinking a few cheap beers at a side walk table.People are always very kind to me, chat all the time for I know enough Chinese to get around on my own. Food is cheap and very good, just know where to eat by my local friends, side walk food is great if you know the vender well. All and all after this year I will retire there for life with no regrets.